By Allan Fox: Terence Crawford (32-0, 23 KOs), Jermell Charlo (30-0, 15 KOs) and Leo Santa Cruz (34-1-1, 19 KOs) are favored to win their fights this Saturday night. Crawford will be fighting on ESPN against WBO welterweight champion Jeff Horn (18-0-1, 12 KOs) in a fight at the MGM Grand in Las Vegas, Nevada. Crawford is the favorite by the following line -850 over Jeff Horn +525. 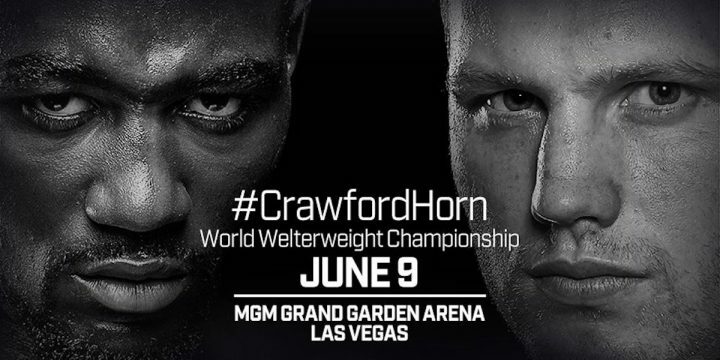 This will be a fight matching the size of Horn vs. the skills of Crawford. It should be a real thrilling fight from start to finish. In the rematch between Santa Cruz and Mares (31-2-1, 15 KOs), Leo is a 5:1 favorite for their fight at the Staples Center in Los Angeles, California. The two fought each other three years ago with Santa Cruz winning a 12 round majority decision. The 31-year-old Mares has won his last two fights in beating Jesus Andres Cuellar and Andres Gutierrez. The problem that Mares has had is inactivity. He’s another once a year fighter in the same mold as Gary Russell Jr. and Keith ‘One Time’ Thurman. Mares fought once in 2016 and once in 2017. If he sticks with that schedule, Saturday’s fight against Santa Cruz will be the only fight for Mares in 2018. Mares is still a very good fighter, but he’s not the same guy he was when he was capturing titles at bantamweight and super bantamweight years ago. Those weight classes were better for Mares, and he was a much busier fighter back then. In other fights this Saturday, WBC junior middleweight champion Jermell Charlo is a tremendous favorite over Austin Trout (31-4, 17 KOs) by the line -950 vs. +575 for Trout. Jermell has improved his game in the last 2 years, developing a great deal of punching power in stopping his last four opponents. The 32-year-old Trout’s career has gone downhill as of late with two defeats in his last three contests. It’s not that Charlo has lost anything from his game. It’s more of a case of him facing fighters with a lot of talent that were simply too big and too strong for him in Jarrett Hurd and Jermall Charlo. Both of those fights were highly competitive. Hurd, 6’1”, wore Trout down and stopped him in the 10th round. But before Hurd got the stoppage, he took a lot of punishment from Trout. If Trout had a little more punching power, it would have been really interesting. If Charlo, 28, wins this fight against Trout, he could be facing Hurd before the end of the year. That would be a really tough fight for Jermell, because Hurd can punch, he’s huge and he throws a lot of punches. Hurd gets better as the fight wears on, and he might have too much for Jermell if he can force him to stand and fight. Trout is the same type of fighter than Hurd is, but he’s not as big or as powerful. Trout walks his opponents down and throws a lot of shots. Five years ago, Trout gave Saul Canelo Alvarez all he could handle in losing a 12 round decision to him. A lot of people thought Trout deserved the victory in that fight.